Thank you for choosing Yueunishi products, we hope it bring you great usage experience. Baby Toys Clip ---Never lose track of your baby's toys or pacifier again with a soft, strong and durable baby toy clip that keeps all the essentials within arm can't reach. 1.8 in 1 package -- baby toys clip toy pacifier dummy holder. 2.Cute baby pacifier holder strap clip are made of high quality fabric, BPA free, safety for babies. 3.Heavy-duty baby toy clip--can hold weight up to 5kg each stoller clip hanger. 4.Easy to use, lightweight, the baby pacifier holder strap clip fits most small toy. 1.Baby Toy Strap Size：15.4 inches/39 cm in total length. 2.Baby Toy Strap Quantity: 8 stroller strap hanger. 3.Baby Toy Strap Materials：high quality cotton fabric. 8 x Baby Pacifier Clip Dummy Clip. 1. Please allow slight dimension difference due to different manual measurement. 2. The actual color may vary slightly from the online image due to monitor color settings. 3. We are committed to your satisfaction. If you are not satisfied by any means, please give us an opportunity to offer you a proper solution. ❤【Package included】 8 x Baby Pacifier Clip Dummy Clip, you can adjust the size that you need by three poppers; If you need longer baby toy clip, can join 8 pieces together to make a longer one. ❤【Parameters】 Baby Toy Strap Size：15.4 inches/39 cm in total length. 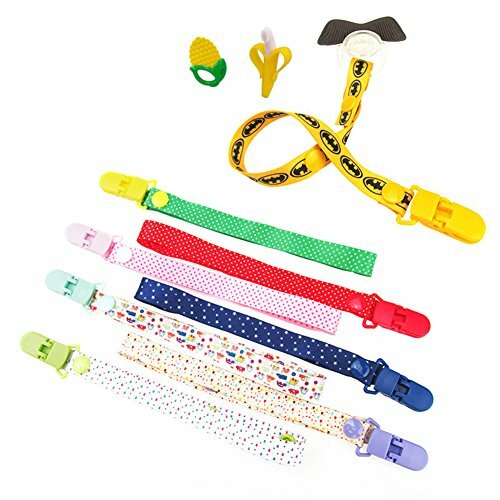 Baby Toy Strap Quantity: 8 stroller strap hanger. Baby Toy Strap Materials：high quality cotton fabric. Easy to attach and detach, you will be amazing that no more dummies or toys dropping on the floor or going missing with this baby toy clips. ❤【MULTICOLOUR & 8 TYPES】Our baby toy clip are in 8 designs, suitable for girls and boys; Baby toy clips are not only attract baby's attention, but also decorate stroller pram, looks lovely and beautiful. These baby toy clips are also a perfect baby shower gift or sprinkle gift ! ❤【VERSATILE USAGE】Baby toy clip are perfectly hold toys, dummy, bottle, teething rings close to your baby to keep it clean and germ-free. Baby toy clip can be use for strollers, car seats and cot. What a multifunctional baby toy clips ! ❤【KINDLY NOTE】 Please don't cover the connecting shackles with baby toy clip on babies' neck to avoid danger. Use the baby toy clip under the guardianship of adults. Please take off this baby toy clip when not using. If you have any questions about this product by Yueunishi, contact us by completing and submitting the form below. If you are looking for a specif part number, please include it with your message.